To advance the experience of orchestral music, support the people and organizations that create it, and champion the contributions they make to the health and vibrancy of communities. I chose the underlined portion of the League’s new mission statement because, today, much dialogue is taking place within orchestra circles around relevance and sustainability in the world in which we live. identifying new pathways for orchestras to be more diverse and to serve audiences that are more reflective and inclusive of their communities. Inclusion is, to me, a cornerstone of building greater relevance. It is not coincidental that this year’s National Conference in Baltimore will focus on “the richness of difference.” And, the cover story in the Winter issue of Symphony magazine giving voice to African-American musicians generated an enormous response among readers. Our orchestras can become the place where music lovers of every stripe can share their unique musical experiences for a broader, richer vision for classical music. Engaging our communities has long been a priority for the entire orchestra family – and many volunteer projects/programs often contain a secondary (if not primary) goal to create new audiences. Through our programs, such as musical petting zoos, elementary school concert series, youth orchestra support, need-based music study scholarship, and ushering service projects, we provide a warm, welcoming face for our orchestra to the community at large. We volunteers are uniquely positioned for great impact in the quest for that richness of difference. We can help our orchestras continue to cultivate new, diverse relationships by recognizing interest, encouraging exploration and inviting participation. Start a dialogue with your orchestra leadership to explore the ways your organization can serve the greater outreach program. Suggest some ways in which your current projects might include a more robust community engagement focus that works in concert with your orchestra’s vision and strategies for inclusion. Let’s pool our energy and resources for the common good of our communities – and the vibrancy of our orchestras. When our orchestra family inside the hall looks more like our community outside the hall, everyone is enriched. Join us to explore “The Richness of Difference” at The League’s 38th Annual Conference June 9-11, 2016 - Registration Now Open … Note: Volunteer pre-Conference activities begin June 8. League in the News – a new League website feature designed to keep you in the know! League of American Orchestras Conference – Why Baltimore? This June, the 2016 League of American Orchestras National Conference will be held in Baltimore, Maryland. From our strategically-placed hotel on the Inner Harbor, Conference-goers can easily walk to historical attractions, shop, and indulge in some of the finest seafood in the country. Explore the city during your free time - attractions such as the National Aquarium and Historic Ships are a short walk from the Marriott Waterfront Hotel. You can grab a water taxi to Fell’s Point, the oldest part of Baltimore, or on to Fort McHenry, where the flag raised to signify victory over the British in 1812 inspired Francis Scott Key to write what would become our national anthem. The excellent Walters Art Museum and the American Visionary Arts Museum are a free bus ride away. The Inner Harbor is teeming with restaurants a few minutes’ walk from our hotel, ranging from seafood (think crab cakes!) to Mediterranean and everything in between. Also just steps away is the Little Italy neighborhood, with its abundance of intimate traditional restaurants serving up pasta and seafood dishes, as well. The main event, however, is attending the League’s Conference! You’ll have the opportunity to listen, learn and network with volunteers from orchestras of all sizes from across the country. Programming by volunteers for volunteers includes award-winning volunteer project presentations, panels, and discussions in a variety of settings. Networking sessions and dinners are planned to make it easy for volunteers to meet, learn, and share their common successes, challenges (when registering, don’t forget to include volunteer “Dine-Arounds”), and make life-long friends. General sessions are open to all delegates. Rub elbows with orchestra trustees, managers, and musicians in sessions led by thought leaders who are charting the paths to reach new and diverse audiences. The Conference theme “The Richness of Difference” provides an exciting message guaranteed to stimulate conversation and generate new ideas for all members of the symphony family. And last but not least, you won’t want to miss the Baltimore Symphony Orchestra (BSO) performance led by Marion Alsop, showcasing this world-class orchestra. We invite you to savor Baltimore June 9-June 11 – Note: Volunteer pre-Conference activities begin June 8, including some very savory Dine-Arounds. You can register for Conference and Dine-Arounds, order tickets to the BSO Concert, and much more simply by clicking here. See you in Baltimore – we can’t wait! 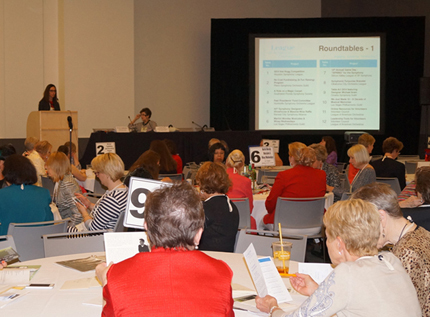 Roundtable winners have been selected and will be presented in Baltimore this year! During the expo-style Roundtable session, Conference attendees can select from a variety of Roundtable presentations that may provide a new idea for their organization or a facelift to an existing project. Have a fairly young fundraising project and are interested in longevity? See how a successful project continues to thrive and evolve for 33 years. Looking for ways to utilize your busy and overcommitted membership? See how this group created a fun and quick way to fulfill volunteer requirements. Is it difficult to keep your membership informed about what is going on in your guild? There is a no-frills method of engaging your volunteers. The Sun, The Moon, and The Stars – Symphony League of Kansas City. As the League’s National Conference in Baltimore fast approaches, we thought readers would have interest in learning more about one of the key people behind the scenes – Ken Cole, the League’s Vice President of Learning and Leadership Development and the architect of Conference. Ken joined the League’s staff in 2014. 1. What have your previous professional experiences been? Working backwards, I came to the League from the National Guild for Community Arts Education, where I held multiple leadership positions over a ten-year period. Prior to that, I was the Director of Advancement at the Levine School of Music, Executive Director of the GALA Chorus, and Director of Development at the Fairfax Symphony. 2. What is your overall role at the League? As the Vice President of Learning and Leadership Development, I lead the professional development and grant-making programs the League has to offer. Some of these projects include, but aren’t limited to, the Getty Education and Community Investment Grants, our National Conference, and the Essentials of Orchestra Management and Emerging Leaders programs. 3. What is your view on the role of the volunteers in regards to the League’s new strategic plan? Volunteers are ambassadors and advocates of the League’s strategies and initiatives in the plan. You (volunteers), help us achieve specific goals like advancing the orchestral experience by identifying new pathways for orchestras to be more diverse and to serve audiences that are more reflective and inclusive of their communities. I believe that in order to accomplish our goal of diversifying orchestras so they are more reflective of the communities they serve, it will take all musicians, staff, trustees, and volunteers working together. I look forward to a long and productive partnership with the League’s volunteer members. Join us at this year’s Conference in Baltimore (June 9-11, 2016) to see firsthand what Ken and his very hard-working team have built for your education and development! Howlett will provide concrete, practical solutions—that don't cost any money and don't require more time—for engaging board members as strategic leaders, compelling ambassadors, and powerful fundraisers. The informative and inspiring seminar takes place at Symphony Center, home of the Chicago Symphony Orchestra, on May 13. It’s designed for teams but individuals will also benefit. Check with your orchestra’s development officer before registering. Find details and register here. The Volunteer Council has kicked off the League’s annual giving campaign for volunteers with 100% participation! All seventeen members and ex-officio members of the Volunteer Council have already contributed to the League’s Annual Fund this fiscal year. Together with several donations made by volunteers during the League’s Day of Giving and Year-end Appeals, we have raised $22,625 or 57% – more than half way – toward our $40,000 goal! We encourage our fellow volunteers to join us in supporting our campaign. Why? This year is a pivotal year. The League, after an in-depth, 18-month assessment, announced a new strategic plan with a renewed purpose and new strategies to help our orchestras navigate the challenging social, demographic, economic, and technological challenges of our times and embrace the exciting opportunities ahead. Your philanthropic gift will fund initiatives to support these strategies for your orchestra and for hundreds of orchestras across our continent. For those who have already given this year, we would like to express our thanks for your support. The League could not do the work that it does without generous donors like you.